Terminate 500 enemy targets in Dawn of War II. Kill 20 enemies using Assault Jump in Dawn of War II. Kill an enemy who is retreating in Dawn of War II. Kill a boss using only your Force Commander in Dawn of War II. Kill a boss in less than one minute in Dawn of War II. Complete "Stand With Your Brothers" and "Retake the Hamlet" in Dawn of War II. Complete "The True Enemy" in Dawn of War II. Complete "The Defense of Argus Gate" in Dawn of War II. Recover the data from the Astronomic Array in Dawn of War II. Complete "Into the Hive" in Dawn of War II. Complete "Secrets of Angel Forge" in Dawn of War II. Complete campaign on Recruit difficulty in Dawn of War II. Complete campaign on Sergeant difficulty in Dawn of War II. Complete campaign on Captain difficulty in Dawn of War II. Complete a mission in co-op mode in Dawn of War II. Complete 15 missions in co-op in Dawn of War II. Complete the campaign in co-op in Dawn of War II. Successfully defend 5 Strategic Assets in Dawn of War II. Complete 10 missions in a row without failing in Dawn of War II. Defend a province without losing a single generator in Dawn of War II. Complete a mission with only ranged weapons in Dawn of War II. Complete a mission under five minutes in Dawn of War II. Earn a 5 star Fury rating in Dawn of War II. Earn a 5 star Resilience rating in Dawn of War II. Earn a 5 star Speed rating in Dawn of War II. Get 15 stars on one mission in Dawn of War II. Gain a second deployment in a single day in Dawn of War II. Gain a third deployment in a single day in Dawn of War II. Attain a campaign score of over 30,000 points in Dawn of War II. Not applicable to guests. 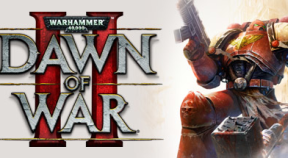 Attain a campaign score of over 90,000 points in Dawn of War II. Not applicable to guests. Own all Strategic Assets in a campaign in Dawn of War II. Not applicable to guests. Max out a Combat Discipline on a squad in Dawn of War II. Not applicable to guests. Reach level 20 with one of your squads in Dawn of War II. Not applicable to guests. Create a 3 player party and play a ranked multiplayer game together in Dawn of War II. Play 10 ranked multiplayer games in Dawn of War II. View a recorded game in Dawn of War II. 100 ranked wins in Dawn of War II. 20 online ranked games completed with Eldar in Dawn of War II. 20 online ranked games played with Space Marines in Dawn of War II. 20 online ranked games completed with Orks in Dawn of War II. 20 online ranked games completed with Tyranids in Dawn of War II. Earn Champion rating 20 times during online ranked play in Dawn of War II. Revive your teammates 50 times during online ranked play in Dawn of War II. Earn a 5 game win streak during online ranked play in Dawn of War II. Achieve an online ranked victory with 500 victory points remaining in Dawn of War II. Create a customized look for any race in the Army Painter in Dawn of War II. Complete campaign on Primarch difficulty in Dawn of War II. Complete "Raid Against the Warboss" in Dawn of War II. Complete "The Wailing Doom" in Dawn of War II. Play 20 ranked games using Chaos in Chaos Rising. Win a ranked game using only Khorne-themed units in Chaos Rising. Win a ranked game using only Nurgle-themed units in Chaos Rising. Win a ranked game using only Tzeentch-themed units in Chaos Rising. Win a ranked Team Battle with each Chaos hero on the team in Chaos Rising. Win 10 online Free for All matches in Chaos Rising. Score 500,000 in The Last Stand with the Hive Tyrant or Sorcerer in Chaos Rising. Reach level 20 in The Last Stand with the Hive Tyrant or Sorcerer in Chaos Rising. Beat wave 20 in The Last Stand with the Hive Tyrant or Sorcerer in Chaos Rising. Defeat the Traitor Guardsmen on Aurelia in Chaos Rising. Defeat the true enemy attacking Angel Forge in Chaos Rising. Answer the enemy commander's challenge on Aurelia in Chaos Rising. Complete campaign on Recruit difficulty or harder in Chaos Rising. Complete campaign on Sergeant difficulty or harder in Chaos Rising. Complete campaign on Captain difficulty or harder in Chaos Rising. Complete 1 Chaos Rising mission in co-op. Complete 6 Chaos Rising missions as a GUEST in Co-Op. Get any squad to maximum Corruption in Chaos Rising. Not available to guests. Reach level 30 with any campaign squad in Chaos Rising. Not available to guests. Unlock the dark secrets of "The Fate of Galan" in Chaos Rising. Complete a mission on the Space Hulk with 4 Terminators in Chaos Rising. Hold 5+ victory points at once in an online Free for All in Chaos Rising. Destroy a Wartrukk with a Noxious Cloud during a ranked game in Chaos Rising. Complete campaign on Primarch difficulty in Chaos Rising.